I found out that Indians could get a visa on arrival to enter Jordan. So, I thought to partly fulfill my promise to Deepshree to take her to Italy to celebrate our 20th anniversary by visiting Jordan. Anyway, I was desperate to visit Petra from all that I had read and from what I saw in Indiana Jones and Last Crusades as I am a huge Indiana Jones fan. So, Deepshree started from Bangalore via Delhi to travel to Amman at around 7PM on 11Sep12. Adventure started from that moment. At the New Delhi Airport, the Royal Jordanian staff told her that the ticket was suspended as it was booked using a credit card. Anyway, they got it activated. Then the Immigration Officer was not sure whether he could let her go as Jordan was not in his list of countries which permitted for visa on arrival. Anyway, he went around inquiring and finally let her through. 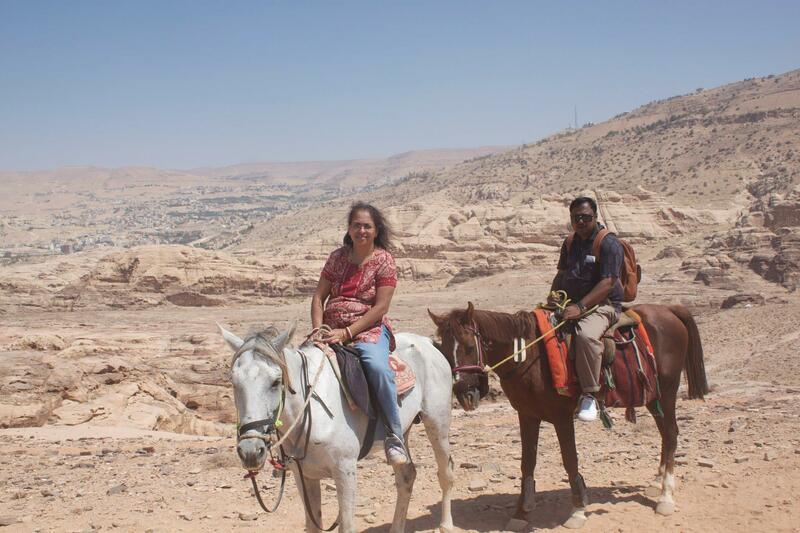 She reach Jordan at around 9AM on 12Sep12 and without any further complication reached Petra from Amman as we had booked a pick up for her through the Movenpick Hotel. I started from Riyadh in the evening after finishing office on Wednesday on 12Sep12 and again the Royal Jordanian found my tickets suspended as it was purchased using credit card. It was now double tension as Deepshree was already in Jordan. After some work for 30 minutes, they got my ticket activated and let me through as well. My flight was 1 hour late and I reached Amman at around 10:30 PM. When I went to Immigration Officer, he sent me to some of his superiors. They inspected my return tickets and my work-permit in Saudi Arabia and decided to grant me 1 week stay in Jordan. So, I got into Amman and went to the Hertz office to collect the car I had booked for renting. I finished the documentation and was ready. However, I did not know how to reach Petra. The problematic part to reach the highway from the city limits. I got some guidance from the Hertz counter manager. Then I discovered that my Mobily connection was not on roaming. This surprised me as many of our top officers in Mobily are from Jordan. Anyway, it was late and thus I bought a Zain SIM from the next shop and activated the Data Service. Now, I opened the map application and pinned Petra and the current location and I was ready. I started out driving on Right Hand Drive for the first time (we drive on Left Hand in India and I do not have a car in Saudi Arabia). I soon got adjusted. However, I could sense that I am driving into the Amman city instead of proceeding on the Aqaba highway. With the help of the map, I got back and thought I was on the right track. To confirm, I stopped at a Coffee Shop and inquired They confirmed that road to Petra was a straight road from that point in the direction I was pointing. So, I had a coffee and chatted with the owner for some time and then started out. The road to Petra from Amman is good and driving was very enjoyable. However, it was already around 1:30 AM by the time I had covered about 80 KMs out the 200 odd KMs. As the road was absolutely empty, I stepped up the accelerator and was soon driving at 160 KMPH. When, suddenly, I found a Police man waving to me to stop. I stopped and he asked me for the license and papers. When I gave him everything, he told me to join him with the other 2 officers. They spoke little English and mostly spoke in Arabic. They told me to give 30 Dinar as fine. I gave them 50 Dinar as that was the least denomination I had. They searched about them to give me the change. When they were struggling, I said it is okay for them to keep the 50 Dinar as I was further getting late. I think they did not understand and suddenly decided to give me back the 50 Dinar and wished me a pleasant stay and with a round of handshakes let me go. Driving for another 60KM, I saw the diversion to Petra marked on the highway. I took the diversion and found myself on a narrow road. The map said that Petra was still 50 KMs away. So, I kept driving and was assured as the road sign kept indicating to Petra being on this direction. After a while I got confused as I could not find indicators to Petra for some time and so gave a call to Deepshree to ask the hotel staff to give me a call and guide me. They called me and told me to keep driving straight. So, I did so and soon reached Petra. Then, with the help of the hotel staff, soon found the hotel. So, we were together in Petra at around 3:30 AM on 13Sep12. Next morning, we had breakfast at around 10:45 AM with the breakfast service being open till 11:00 AM. We then checked out of the hotel and requested them let us park our car there and they agreed. We set off for Petra whose entrance was right opposite the hotel gate. We bought the entrance tickets at 50 Dinar per person and set off. As a part of the entrance ticket, one is entitled to free ride on a horse till the entry point and we took that instead of walking though Deepshree was reluctant as she had never ridden a horse. For whatever reason, she bit the bullet. At the entrance, we met a guide, who told us that we could go through the conventional path which was a smooth road or we could try the mountain road and reach the Petra City from the back. This way we get a full view of the Petra instead of just the built up area. After a thought, I thought we should ride through the mountain as it would be exciting. So, again we mounted 2 horses and started. This was the beginning of a great adventure as the mountain path was really treacherous and we were just clinging on the saddle. We forgot all about taking photos as it was just not possible for the effort you need giving to the ride. Deepshree was extremely nervous, but kept on. We came to a point where one had to walk as the path was not conducive for riding. It was very difficult to walk as well. However, we managed to cross the same. Then, we were riding once again up the hill. Then, the decent started and Deepshree could not take it any longer. She got down from the horse and started to walk and needed help from the guide at all the tricky points. The path did not seem to end as we were crossing hill after hill. Ultimately, we came to plain land when all of a sudden, my horse just collapsed to the ground with me on it. I was lucky that I suffered no injury and the camera was not damaged. The guide told me that the horse was too tired. So, I continued on foot from that point. Anyway, we were close to the path from where one had to go on foot as there were stair built-in the mountain. We had reached the highest point in Petra from where the complete city was visible. We started the descent through the stairs. All around us was very scenic and I was enjoying myself. Deepshree was struggling as her legs would take her no more. However, she kept at it and after walking down the stair for nearly 1 hour, we saw the built up area. We could see the houses built-in the mountains, the amphitheatre and other exquisite structures, all that I had seen in the photos and books. The ground here is plain. However, Deepshree could walk no more and so we took a Donkey for her. With Deepshree riding a Donkey and me and the guide on foot we set out into the city. It was out of the world. Soon, we reached the Treasury which was what I had dreamt of seeing after watching Indiana Jones. So, the dream was fulfilled. We spent some time here and then decided to take a carriage back to the entrance. The carriage ride was also very exciting as we travelled on cobble road and as the driver promised, we had a free massage during the 30 minutes drive. At the entrance, we again took the free horse ride back to the main gate. It was 5:45 PM when we started off from Petra heading to Dead Sea. Again, we set the map and could see the path. However, the problem was getting on the track from within the city limits. We were struggling and decided to ask a taxi driver. He was extremely kind and told us he would drive ahead of us till the starting point of the road to Dead Sea. We followed him and reached the point and thanked him and started out again. It was a great drive as the road was hilly as all around was very scenic. The road was narrow, however, we drove at a decent speed. On the way, we stopped at Dana. At around 7:00 PM reached a city called Al Tafila. This is a reasonably populated city and we filled petrol here. Now, the same old problem, how to get out of the city on the track. We asked people and got directions and kept proceeding. We came to a roundabout where there were 5 road leading out of it. We thought we should go ahead to Al Karak as the map suggested and headed in that direction when we realised that we are heading into the city. So, we turned back and came back to the roundabout. We took another road and came back to the roundabout as the map suggested we were moving away from our path. We took each of the roads and the same result. We had asked many people in the process. However, we found to our surprise that people did not understand Dead Sea. When we would say “Dead Sea”, they asked back whether we needed a Taxi. After lot of struggle, we set on our way back into the Al Tafila town and saw a bunch of Policemen and decided to ask them. It was again difficult to communicate as they did not understand English. Ultimately, I gave up and thought of sitting down somewhere to think further. Also, the charge in the iPhone was running out and there would be no map after that. So, at 8:45 PM we stopped at a restaurant and ordered food and put our iPhone for charging. I decided to call the Marriott Hotel and ask them for help. The guy who received the call diverted the call to the Travel Desk. I am extremely disappointed with this as he was being irrelevant. Seeing my irritation, one local person came to me and asked what was the problem. I requested him if he could explain to the Marriott person as to where I was so that he could help me. He talked to the Marriott staff in Arabic and then told me not to worry as he spoke perfect English and he would help me. He sat me at a table and took out a paper and drew precise directions for finding the road to the Dead Sea. I thanked him, the restaurant staff and collected the iPhone and set off as per the map given by the person. After driving for about 12 KM, we found that we were on track as per the map. We were driving through the Jordan Valley and road is quite tricky here with lots of twists and turns. I was enjoying myself while Deepshree was extremely worried as it was pitch dark outside with no one else in any vicinity. We soon reached the Amman highway and were relaxed. We reached Marriott at around 11:00 PM and checked in and ordered food from room service (as all restaurants had closed) and ate and slept. Marriott is a very lovely hotel which we discovered next morning and went around and had an elaborate breakfast. Then, I went towards my next fascination – the Dead Sea. The Marriott has a private beach which is extremely rocky. However, Marriott has kept shoes which can be used in the beach so that your feet are not hurt. We slipped on the shoes and went to the sea. I changed and was soon in the sea. There were another 2 couples there at that time – one young couple and one elderly couple. The elderly couple advised me to be careful not to let any sea water enter the eye and to avoid taking any of the sea water in the mouth. The younger couple told me not to worry as I could not drown. I headed inside and was soon floating in the Dead Sea. Now, the water of the Dead Sea is extremely oily. I was confused whether it was water or oil. And as promised, you do not need swimming as you float naturally. I enjoyed myself. However, in excitement, some water hit my eyes and it was extremely painful. Anyway I recovered. Then I went to the mud pit and applied the Dead Sea mud on whole of my body and went back to the sea. Deepshree decided to stay out of water. She really missed something. After some time, I came out and washed myself in the shower provided by Marriott and got ready and headed back to the hotel. Soon, we checked out at 12:00 noon and were on our way to Amman. Amman is just about 50 KMs from Dead Sea and the highway is extremely good though it has a few twists and turns as the road is through the hills. I called up Mugeeth who had promised to meet me in Amman. We decided upon the meeting point and were on our way. Soon, we were in Amman and were driving through the city to reach our rendezvous i.e. Royal Jordanian office. After trying for some time using the map, we did not manage the Royal Jordanian office, though we knew that we were within 1 KM of the same. So, I parked the car in front of a general stores and called Mugeeth and with the help of the shopkeeper explained our exact location. Mugeeth came to where we were waiting with his wife. So, we had met. He then took us to the Roman Amphitheatre. There he helped Deepshree to buy some souvenirs and we went around the Amphitheatre which was wonderful. Then, he treated us to Jordanian sweets and then took us to Ward Restaurant for lunch. It was nearly 5:00 PM now. Deepshree’s return flight was at 8:20 PM and so we had to be in Airport by 6:00 PM. So, Mugeeth order food accordingly and ordered for the Shisha which he had committed in Riyadh. The food was delicious as was the ambiance of the restaurant. The 4 of us had a great time. It was 5:45 PM when we decided to head to the Airport. Mugeeth told us that he would put us on the Aqaba highway and from it would be 40 minutes to the Airport. We reached the Aqaba highway and took leave from Mugeeth and his wife. We started to drive to the Airport with the map on in the iPhone. Soon, I saw a sign saying that we need turning right to go to the Airport. By the time I realized it, I had already crossed it. So, I started to hunt for the nearest U-turn. We found a U-Turn nearly 10 KM later and on driving back drove for another 17 KM before find our way back on the Aqaba highway. This time we took the diversion properly. However, to our surprise, we found that we were headed away from the Airport. This made me nervous as it was already 6:30 PM. So, I decided to stop and asked Deepshree to get out of the car with her luggage. We waited and got the first taxi which came our way. I put Deepshree in the taxi and told the Taxi Driver to take her to the Airport and I would follow him as fast as I could. The Taxi Driver took the same route we had taken before taking the U-turn. This surprised me as I realised that the diversion marked was wrong and that is what had misled us. However, there is no sign post in this road to show to the Airport. We kept driving and ultimately reached the Airport at about 7:10 PM. I told Deepshree head straight to the check-in counter and I would take care of the taxi. Deepshree, by mistake, went to the Premium check-in counter. There the officer was extremely kind as he realised that she was late and the economy gates had actually closed. So, he made premium express check-in for her and within 10 minutes she was at the boarding gate for her flight. It was an extreme stroke of luck that she had made it to her flight. I called up Hertz and they came and collected the car and I paid up and went to check-in for my flight to Riyadh. There was no further adventure as the check in was smooth and I had enough time in hand for a few smokes. I called up Mr. Swamidas, who drives me around in Riyadh, to collect me from the Riyadh Airport. I reached Riyadh on time and then was home by around 1:30 AM. I sat on Facebook to upload the photographs and then called Deepshree at around 3:30 AM to understand that she had reached Mumbai. So, I slept to be ready for office the next day. The stories remind me of modern day Arobyyo Rajani (Arabian Nights). All the pictures are good but 3 out of them are draws extra attention . 1. Smoking Hukkha like Sheiks. 2. Floating on the Dead Sea. 3. Riding on the horseback (alone).. Please keep it up Partha da…. This was really good explanation of a beautiful journey!!!! Keep it up..
1. Reflex Agents: These agents purely depend on memory (available through data stored in databases) and purely work by extracting actions from the database and executing them. These agents are stuck if they come across situations for which appropriate data is not available in the database. 2. Planning Agents: A planning agent does not entirely depend on memory. Instead, it tries to find an optimal way to achieve a goal taking into consideration possible consequences of the applied method. 3. Optimising Agent: An optimising agent also does not purely depend on memory, but also considers possible consequences. However, before embarking on a solution, it considers all the possible options and then selects the best option for the most optimum solution for the problem space. I was a reflex agent during the recent trip to Jordan. Need to study to at least be a planning agent in this lifetime. This trip was very special.